The Predator 20 will clean through 20,000 square feet per hour with a 20 inch cleaning path that fits easily through doorways and into tight spaces. The perfect size for medium to large size scrubbing jobs, the self-propelled Predator 20, with direct drive, will clean 20,000 square feet per hour. The PAS20 features aggressive cleaning power with 90 lbs. of floating brush pressure. Thick slurry is no match for the 3-stage vacuum motor. Maintenance is made simple with easy access to batteries, vacuum motor and tanks, plus a lifetime lubricated differential motor. 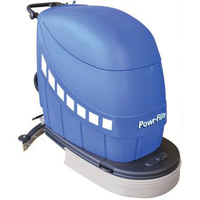 Battery operated scrubber provides a run time of up to 4 hours for continuous scrubbing power. Easy access to batteries, vacuum motors and tanks, and with lifetime lubrication on the differential motor. Electronic motion control going both forward and backwards. Rear mounted drain hose for easy disposal and cleanup. 3-Stage suction motor that vacuums up the waste much easier than most automatic scrubbers. Solution/ Recovery Tank: 17 gal./ 17 gal.